At Nelson Appliance, there is no need to make an appointment to bring us your broken small appliances or vacuum cleaners. Come any time and let us provide you with a free repair estimate so we can get your appliance back into your home and back into working shape. Once received, most items are diagnosed within 3 to 5 days. If under warranty, and needed parts are on-hand, the repair is completed and the customer is notofied that the item is ready for pick-up (or unit is prepared for return shipment to customer if necessary). If the item is not within warranty, an all-inclusive repair estimate is prepared and discussed with the customer. Upon approval, the repair is completed and the customer is notified of its ready status. If the item was shipped to us, we will collect payment information from the customer upon estimate approval. Payment will be processed once the item is repaired and tested, and the item will be prepared for shipment. Any item for which we will need to order parts will incur a delay of, in most cases, 7 to 14 days. Once parts have arrived, work is completed in short order. If a customer decides the repair cost will be too high, they may elect to decline the repair and either pick up the item or instruct us to recycle it. Because our estimates are free, there is no charge to the customer for the analysis or disposal of the item. All completed repairs are warranted for 90 days, parts and labor, with the exception of vacuum cleaner belts (warranted for 30 days). Vacuum Cleaners / Floor Care items: We make every effort to turn these repairs around within 1 to 2 days. If necessary, we do have loaner vacuum cleaners available to lend at no charge while your vacuum is being repaired. 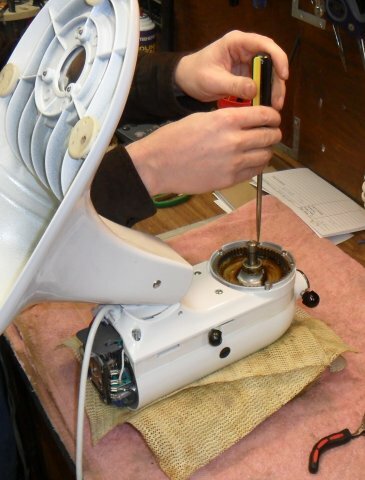 Shavers: We make every effort to complete shaver repairs within 24 hours.